Programmers were quick to realize that this kind of approach wouldn't last long. There were plenty of ideas for alternatives. Like RRP, a stylesheet language that favored abbreviation and brevity, or PSL96 a language that actually allowed for functions and conditional statements. If you’re interested in what these languages looked like, Zach Bloom wrote an excellent deep dive into several competing proposals. But the idea that grabbed everyone's attention was first proposed by Håkon Wium Lie in October of 1994. It was called Cascading Style Sheets, or just CSS. CSS is a declarative programming language. When we write CSS, we don't tell the browser exactly how to render a page. Instead, we describe the rules for our HTML document one by one and let browsers handle the rendering. Keep in mind that the web was mostly being built by amateur programmers and ambitious hobbyists. CSS followed a predictable and perhaps more importantly, forgiving format and just about anyone could pick it up. That's a feature, not a bug. CSS was, however, unique in a singular way. It allowed for styles to cascade. It's right there in the name. Cascading Style Sheets. The cascade means that styles can inherit and overwrite other styles that had previously been declared, following a fairly complicated hierarchy known as specificity. The breakthrough, though, was that it allowed for multiple stylesheets on the same page. See that percentage value above? That's actually a pretty important bit. Lie believed that both users and designers would define styles in separate stylesheets. The browser, then, could act as a sort of mediator between the two, and negotiate the differences to render a page. That percentage represents just how much ownership this stylesheet is taking for a property. The less ownership, the more likely it was to be overwritten by users. When Lie first demoed CSS, he even showed off a slider that allowed him to toggle between user-defined and developer-defined styles in the browser. This was actually a pretty big debate in the early days of CSS. Some believed that developers should have complete control. Others that the user should be in control. In the end, the percentages were removed in favor of more clearly defined rules about which CSS definitions would overwrite others. Anyway, that's why we have specificity. Çelik knew that in order to make CSS work, these differences would need to be reconciled. His solution came after a conversation with standards-advocate Todd Fahrner. It's called doctype switching, and it works like this. That's an example of a standards-compliant doctype. The //W3C//DTD HTML 4.0//EN is the crucial bit. When a web designer added this to their page the browser would know to render the page in "standards mode," and CSS would match the specification. If the doctype was missing, or an out of date one was in use, the browser would switch to "quirks mode" and render things according to the old box model and with old bugs intact. Some designers even intentionally opted to put their site into quirks mode in order to get back the older (and incorrect) box model. Eric Meyer, sometimes referred to as the godfather of CSS, has gone on record and said doctype switching saved CSS. He's probably right. We would still be using browsers packed with old CSS bugs if it weren't for that one, simple trick. In the 10 years that the web hurtled towards ubiquity without a coherent or standard styling language, it's not like designers had simply stopped designing. Not at all. Instead, they relied on a backlog of browser hacks, table-based layouts, and embedded Flash files to add some style when HTML couldn't. 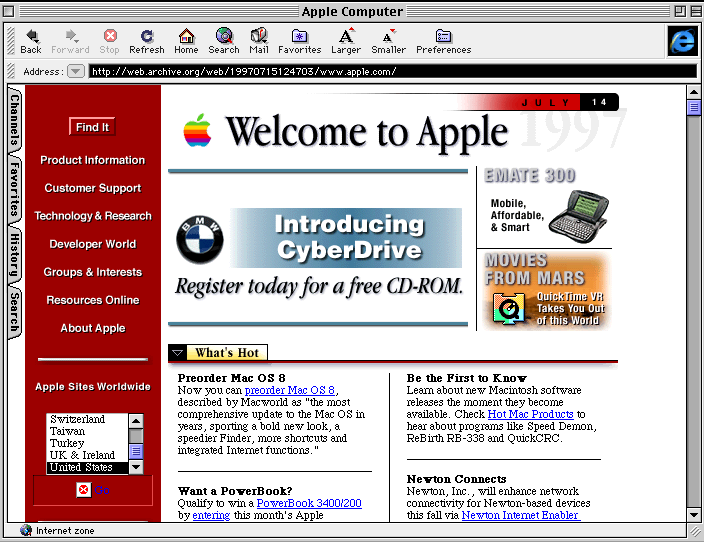 Standards-compliant, CSS-based design was new territory. 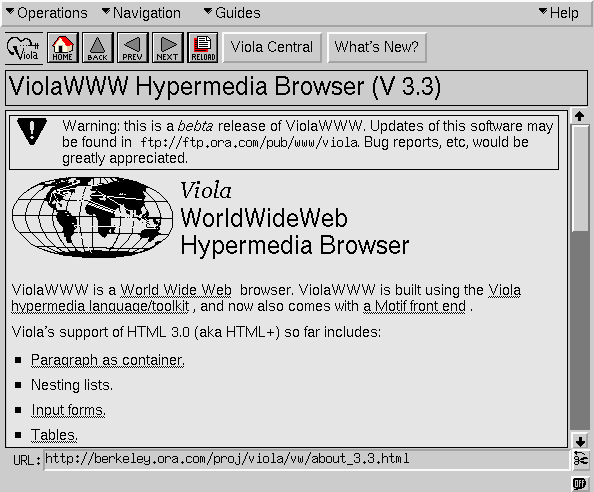 What the web needed was some pioneers to hack a path forward. Dig through the code of these redesigns, and you'd be sure to find some hacks. The web still only lived on a few different monitor sizes, so you may notice that both sites used a combination of fixed width columns and relative and absolute positioning to slot a grid into place. Images were used in place of text. 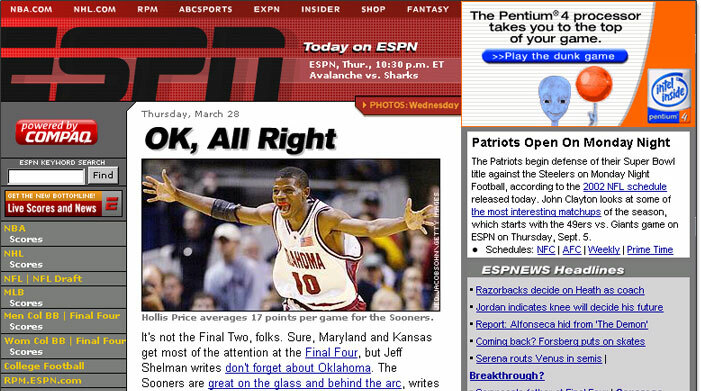 But these sites laid the groundwork for what would come next. Yet another hack for IE6. I wonder how close you could get to designing a modern web page layout with only CSS Level 1? Would be a great challenge! Browser support is a key in CSS implementation. By the end of the 90’s, IE5 was taking the lead over Netscape4. And Netscape 6 came out with a breaking change, supporting already a lot of CSS and way better, but so differently, it was not widely adopted and IE6 buried it. But Netscape didn’t completely died… the phoenix came back through Mozilla 1.0, using the open source code of Netscape. Then with CSS inconsistencies (double-margin bug, IE hacks…). Now we just have 250 screen resolutions. Piece of cake! This site completely altered my outlook on html structure, CSS and design in general. I learned to take a very close to stock HTML structure and turn it into almost any layout. It really opened my eyes to what CSS could do for web designers and developers. I hope the react css-in-js nuts don’t wreck future web standards that created the beauty in simplicity that is modern CSS. I am all for doing what needs to get done, but we got here for a reason. Internet Explorer included attributes like margin and padding inside the total width and height of an element. I don’t think the margin has never been included inside the total width and height of an element. It was the border, not the margin that was part of the box’s dimensions (width/height). Good stuff. But you omitted The Web Standards Project, without which none of this would’ve happened. Tantek and Eric did what they did as participants in WaSP-led initiatives. A List Apart’s promotion of WaSP values to designers and developers and early use of CSS layout inspired what Doug and Mike did at Wired and ESPN, respectively. Dozens of WaSP members and thousands of eventual supporters drove this movement. Their contributions deserve to be remembered. Thanks for reading, and thanks for pointing that out! I didn’t include it in this post, but you are absolutely right that it would have fit. WaSP is an organization I find myself coming back to over and over again in the newsletter I send out every week, though I’ve never had a chance to tell the full history of WaSP, and it’s incredible influence over the web’s trajectory, something I most certainly want to do. If you ever had some time, I would love to quickly chat with you about what it was like joining and leading WaSP so that I can make sure I have everything right. Either way, I definitely want to tell that story and I hope that when I do, I do the project and its members, who I agree we owe an enormous debt of gratitude and need to be remembered, justice. And it’s not over yet! IE still has its annoying quirks and is going strong! Are you sure IE isn’t mostly dead? I can’t think of a good reason to support anything lower than IE 10 (only because of windows 7), and it’s not super horrible with CSS anymore. There’s a note that says theses are the “non-mobile” list, so this cuts these values in real world terms in more than half. So the actual percentage of IE use on the net is more like 1.5% – 7%, being very generous. And considering these are worldwider numbers, and many designers focus on the businesses in their own countries (US for my company), this makes this number even less relevant. The final nail in the IE coffin is that MS doesn’t even support IE anymore. And if a client says their site doesn’t look good/correct in their browser, I point out the security implications of using unsupported browser and they upgrade and the problem goes away. Last but not least, if a client wants to support IE, I simply provide an estimate of costs to support it, with a known percentage of users with IE, and 100% of the time, they decline to pay for IE support. First off, I let my clients decide, and they pay for the support. Can’t give away a potentially large percentage of the cost of project for free. Last, it hits a point where you just have to move on. IE 6 hung around a really long time. And despite it’s solid percent of users, I (and I bet everyone else here) had to just cut support and let IE 6 users see a messy site. Even you are deciding right now to cut support for something. Where is the line? How do you choose where the cutoff line is? Factor in all the data you can, and make an educated, common sense choice. 2006 is when IE 7 was released. I’d surmise you don’t support any these browsers. … the April 2016 security update the last ever public update for IE7. Having things look bad in IE 7 is a GOOD thing. It is the smallest thing we can do as designers (short of an actual message) to help people realize they are using an insecure browser. I think it’s our duty as webdesigners to instantly stop all support for any and all browsers that no longer receive security updates from their developers. How can you in good conscience knowingly make a site look correct in a browser that is pretty much guaranteed to hurt the user? Again, that is 1 and 1/2 years of insecure IE 7, and who knows about the others… The only version of IE that is getting security updates is version 11. I was being paid for designing web sites before CSS was a thing. I think the value of the Acid2 (and later Acid3) tests in giving us a consistent CSS experience should not be overlooked. In a simple page it gave the web standard developers a tool to demonstrate how the standard should be implemented and browser developers used it, among others, as a point of pride and contention when touting CSS support. Without it and similar tests, we would still be in the world where the ambiguities in the wording of the specification let implementors choose which way to implement certain rules based on what was convenient for them, rather than what would be convenient to the web designers and users.